France is invoking state of emergency law to impose curfews, call up police reservists, and stage raids to search for weapons, in an effort to stop rioting that spread out of Paris' suburbs and into nearly 300 cities and towns across France. Nearly 900 people have been arrested; so-called "fast-track" trials are being used to punish rioters. The tough new measures came as France suffered through a twelfth night of what is its worst civil unrest in decades. 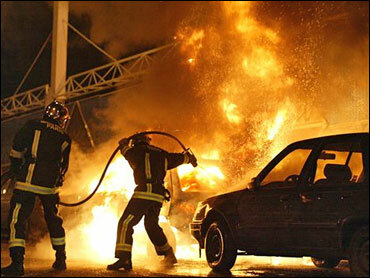 Police say vandals burned 1,173 cars overnight, a few less than the previous night, over 1,400 vehicles were torched. There were also fewer towns affected: 226, as opposed to the nearly 300 of the day before. The Cabinet met in special session Tuesday to put the plan into effect. Only the Cabinet can declare a state of emergency, which can initially last only 12 days. Parliament must vote on any extension beyond that. The plan to allow curfews to halt riots that have spread across France was first announced by Prime Minister Dominique de Villepin on Monday night. He said the government would invoke a 1955 law that allows the declaring of a state of emergency in all or parts of France. Asked on TF1 television whether the army should be brought in, de Villepin said, "We are not at that point." But "at each step, we will take the necessary measures to re-establish order very quickly throughout France," he said. "That is our prime duty: ensuring everyone's protection." Local officials "will be able to impose curfews on the areas where this decision applies," President Jacques Chirac announced. "It is necessary to accelerate the return to calm." Among other powers, police will be able to conduct raids if they suspect weapons are being stockpiled, said Interior Minister Nicolas Sarkozy. "We will now be able to act in a preventative manner to avoid these incidents... For a period of 12 days, raids will be possible every time that we have a suspicion of a stockpiling of weapons." Outside the capital in Sevran, a junior high school was set ablaze, while in another Paris suburb, Vitry-sur-Seine, youths threw gasoline bombs at a hospital, police said. No one was injured. Earlier, a 61-year-old retired auto worker died of wounds from an attack last week, the first death in the violence. Apparent copycat attacks took place outside France, with five cars torched outside the main train station in Brussels, Belgium. German police are investigating the burning of five cars in Berlin. The mayhem is forcing France to confront anger building for decades in neglected suburbs and among the French-born children of Arab and black African immigrants. The two teenagers whose deaths sparked the rioting were of Mauritanian and Tunisian descent. They were electrocuted as they hid from police in a power substation, apparently thinking they were being chased. "It is really the result of groups of angry youths who feel like they have no way out," Vanity Fair contributing editor Janine di Giovanni told CBS News. "Unlike Britain, unlike the Netherlands, they don't feel that Muslims are represented in the political process. So this is, in a way, their way of giving themselves a voice." Chirac, in private comments more conciliatory than his warnings Sunday that rioters would be caught and punished, acknowledged in a meeting Monday with Latvian President Vaira Vike-Freiberga that France has not integrated immigrant youths, she said. Chirac deplored the "ghettoization of youths of African or North African origin" and recognized "the incapacity of French society to fully accept them," said Vike-Freiberga. France "has not done everything possible for these youths, supported them so they feel understood, heard and respected," Chirac added, noting that unemployment runs as high as 40 percent in some suburbs. Vandals burned more than 1,400 vehicles overnight into Monday, as well as churches, schools and businesses, and injured 36 police officers in clashes around the country, setting a new high for arson and violence, said France's national police chief, Michel Gaudin. Attacks were reported in 274 towns. "This spread, with a sort of shock wave spreading across the country, shows up in the number of towns affected," Gaudin said. In terms of material destruction, the unrest is France's worst since World War II — and never has rioting struck so many different French cities simultaneously, said security expert Sebastian Roche, a director of research at the state-funded National Center for Scientific Research. The emergency measures including the calling up of 1,500 reservists to reinforce the 8,000 gendarmes and local police who are already deployed. Villepin said "organized criminal networks" are backing the violence and youths taking part are treating it as a "game," trying to outdo each other. He did rule out the possibility that radical Islamists are involved, saying: "That element must not be neglected." France's community of Muslims, at some 5 million, is western Europe's largest. Local government officials will be able to impose curfews "if they think it will be useful to permit a return to calm and ensure the protection of residents. That is our No. 1 responsibility," the prime minister said. A Socialist opposition leader, Francois Hollande, said his party would closely watch to make sure the curfew law is applied properly. "This law cannot be applied everywhere, and it cannot be long-lasting," Hollande said. He said Villepin should have put more emphasis on improving life in tough neighborhoods and said the premier's proposals were vague. Villepin said he wanted to speed up a $35.5 billion urban redevelopment plan, triple the number of merit scholarships for talented students and offer jobs, training or internships to disadvantaged young people. "We must offer them hope and a future," he said. France's biggest Muslim fundamentalist organization, the Union for Islamic Organizations of France, issued a religious decree against the violence. It prohibited all those "who seek divine grace from taking part in any action that blindly strikes private or public property or can harm others." The first fatality is identified as 61-year-old Jean-Jacques Le Chenadec. Police say he was trying to extinguish a trash can fire Friday at his housing project in the northeastern Paris suburb of Stains when an attacker caught him by surprise and beat him into a coma. "They have to stop this stupidity," his widow, Nicole, told Associated Press Television News of the rioting. "It's going nowhere."